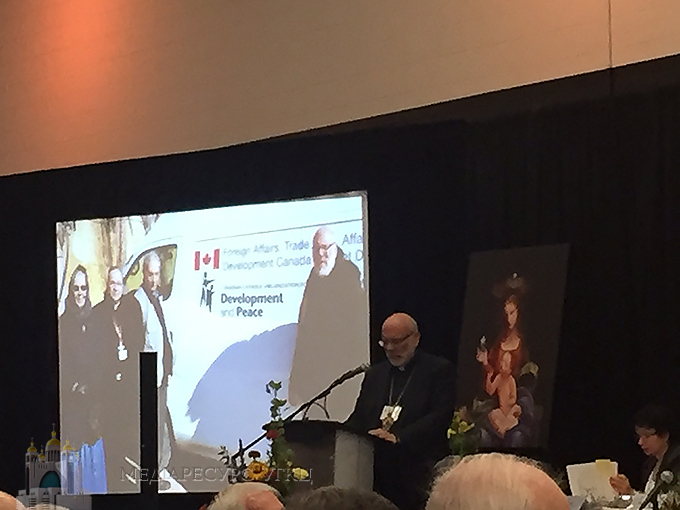 On the fourth day of the Plenary Assembly of the Canadian Conference of Catholic Bishops (CCCB), the Commission for Doctrine led a reflection on the elements and nature of pastoral accompaniment. This session of pastoral animation began with a recapitulation on the themes presented the day before by Cardinal Marc Ouellet in his second reflection on the Apostolic Exhortation Amoris Laetitia and was followed by discussions in breakout sessions. Later in the afternoon, the Bishops reflected on the situation in the Middle East from the perspective of the persecuted Christians in the region. This second session of pastoral animation was led by the Commission for Justice and Peace. To assist in the reflections on the situation in the Middle East, the Commission invited the following to participate in a panel chaired by the Most Reverend Raymond Poisson, Bishop of Joliette and a member of the Commission. The other members of the panel were the Most Reverend Lionel Gendron, P.S.S., Bishop of Saint-Jean-Longueuil, currently Vice President of the CCCB and now also President elect, who had participated in the 2017 annual meeting of the Coordination of Episcopal Conferences in Support of the Church in the Holy Land; the Most Reverend Paul-Marwan Tabet, Eparchial Bishop for Catholic Maronites in Canada; as well the Most Reverend Ken Nowakowski, Eparchial Bishop of the Ukrainian Catholic Eparchy of New Westminster, who with Bishop Poisson shared the experiences of their visit to Lebanon and Syria in February 2017 which had been arranged by the Canadian Catholic Organization for Development and Peace. The fourth day of the Plenary also included the annual meeting of the English Sector and ended with Vespers according to the Ukrainian usage of the Byzantine Rite. This celebration was presided by the Most Reverend Lawrence Huculak, O.S.B.M., Eparchial Archbishop of the Ukrainian Catholic Eparchy of Winnipeg and Metropolitan of Ukrainian Catholics in Canada.